Starting in August 2019, Milford's Transportation Department will share bus routes electronically via ELinks. No postcards will be mailed home with routing information. MEVSD parents should use their student ID number for both username and password to login. Parents of private/parochial students served by our district can log on using their 10-digit home phone number for their username and password. Throughout the school year, the district continues to receive new students and students with a change of address. These changes may impact the routing slightly throughout the year. We ask that parents give us a 5-7 minute window or check ELinks for updates. MEVSD parents use your child's student ID number for both the username and password. Private/parochial students served by Milford Schools use your 10-digit phone number for both username and password. Click on your “student's name” to view transportation record. 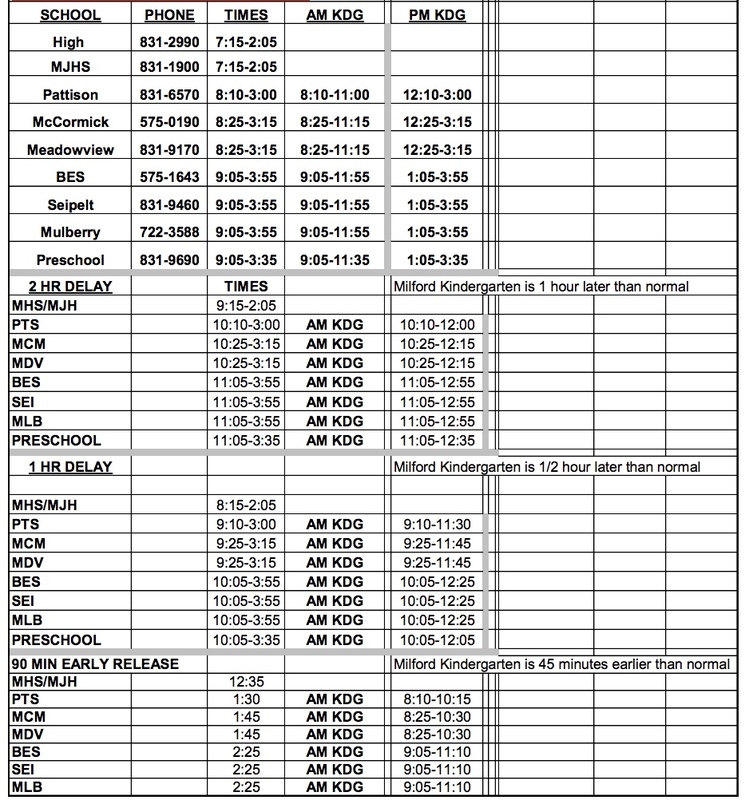 Below is the schedule of start/end times for each of Milford's schools. The district has a contract with Petermann Bus Company for the management of the department and the leasing of a majority of the buses. Petermann is also the employer of the transportation staff, so all Milford bus drivers are Petermann employees.